But when you’re on a smaller staff, you have to work with whatcha got. But, because I work on a small staff, everyone is comfortable with each other, and I had no problem knowing when to ask for help (even though I didn’t want to). Feb. 10, 2015: I, Lauren Horsch, am finishing my day at The Herald-Sun’s newsroom. It’s after 5 p.m., I’m biding my time. Just waiting. I hear a call for mutual aid go out. I heard “gun shot wound.” I’m on edge. I see a breaking news alert from a competitor. Three shot. Possible triple homicide. My heart sinks. Another 10-hour Tuesday. I file the breaking news alerts, we change the layout of A1. I go home and wait some more. 2:45 a.m. – I’m woken up by something. I check my emails. I go to work. The identities of the victim and suspect have been released. A 23-year-old man, a 21-year-old woman and her 19-year-old sister. The police arrested a 46-year-old Chapel Hill man. He’s in custody. His first appearance is in eight hours. 3:30 a.m. – Horsch, you should try to go back to bed, I tell myself. Instead, I’m on Twitter looking at tweets from #ChapelHillShooting. Now I can’t sleep. I’m trying to find out more details. I want to talk to the families. I want to know what is happening. I’m looking at wedding photos. I’m looking at Twitter pages. I’m writing a story. In about an hour I’ll send out the first breaking news alerts for the day from our paper. I’ll continue writing. 5:30 a.m. – I go back to bed. 7:30 a.m. – I wake up. Back to work. 8:50 a.m. – The Herald-Sun Newsroom. Write another quick article. Strategize with editor. Go to crime scene. 10:20 a.m. – Arrive at scene. Nothing really going on. Talk with some national press, but just pal around with the local press. Talk to a few people walking up to the scene wanting to pay condolences. Just hang out until I need to write. 1 p.m. – Try to go back to the newsroom. Get caught up talking to some other reporters. Realize you haven’t eaten anything. Go get lunch. 2 p.m. – Back in the newsroom with lunch. 2:10 p.m. – Learn of a new press conference at 3 p.m. back in Chapel Hill. Eat whatever I can. Put the rest in the fridge. Leave. 3 p.m. – Press conference with suspect’s wife. 3:40 p.m – Find a coffee shop. Write. Try not to commit a felony when the baristas play only Taylor Swift songs. 6 p.m. – Back in the newsroom. Talk with editors. Try and remain calm. I don’t remember when I got home. All I remember is calling my dad and emailing a professor from J-School. Looking back, all I can really think about is how strange it was to be at the forefront of something like this. Local media organizations have always held my heart. I started my journalism career interning with my hometown newspaper. I didn’t think that at the age of 23 I’d be getting calls from the BBC and Fox News to go on the air and talk about the coverage. I didn’t think that my friends would send me links to Buzzfeed and Mashable articles where my tweets were embedded. When you work as a reporter in a small metro area you get to know the reporters you’re competing with. You know their families, you share jokes with them. They’re the people you hang out with during press conferences, crime scene runs and while you make copies at the Clerk of Court’s office. So when national media shows up, that flow gets thrown off. In talking with folks from national media outlets we all knew that the Chapel Hill shootings were tragic – ridiculously heartbreaking. But for me, especially, being a young reporting covering her first story that was gaining national attention, I had to take myself back a bit. When the speculation of the killings being a hate crime popped up on Twitter, my heart sank. You start to worry. What if it is a hate crime? How does the coverage change? For me personally, a lot of thought was put into how I was going to be covering the shootings. I have yet to call the murders a hate crime. I’ve used the family’s words. They want the murders investigated as a hate crime. And now, after some outcries, law enforcement is doing so. We don’t know if that was a motive they were already looking into, search warrants semi-hint to it. They caught a look at the suspect’s Facebook, which trust me, isn’t a fun thing to have to sift through. It was hard to believe the preliminary motive – an ongoing parking dispute. Really? Parking? I’m pretty sure a few expletives left my mouth when I read the release. Everyone in the newsroom was in disbelief. That’s when I knew we had to be careful. The narrative of the story was tricky. I didn’t know what to do. I was hoping how I was thinking of playing the story would be what my editors wanted. I didn’t want to avoid the term “hate crime,” because avoiding it would be a miscarriage of ethics, but I didn’t want to overplay it either. 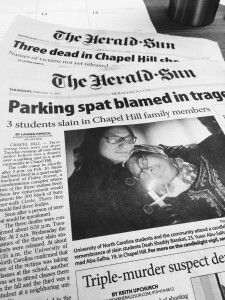 I think, overall in the coverage me and my colleagues produced, we did a good job at keeping the narrative open to not only the parking dispute, but also the possibility of a hate crime. After all was said and done the metro editor and I had a short discussion about everything. We talked about our thoughts on the coverage and how we played out the possibility of the hate crime. We were confidant that we played it out how it should have been — giving equal time to each narrative. In talking with professors and other colleagues, the coverage we were able to smash out with about three reporters was the exceptional. At the end of the day I turned in about 80 inches of copy, which is no small feat when you’re on deadline and having to listen to Taylor Swift on repeat in a Starbucks. Journalism school prepares you for so much, yet so little. There’s been times when I’ve been sitting at a crime scene thinking about how J-School doesn’t prepare you to see a pool of blood or talk to a grieving family — let alone ask a grieving family member about the brutal death of a loved one. It doesn’t prepare you for the worst in humanity. Eventually you get the hang of it, but until you do it can be hard. Images stick with you. Eventually you forget the stories and the dates, but the images will last, and when the images come back so do the stories. However, it does prepare you to know when to ask for help. It prepares you to ask yourself the hardest questions. And at the end of the day you can look back at your 80 inches of copy and know that you did the absolute best you could.